1 Peter 3:4 (KJV); But let it be the hidden man of the heart, in that which is not corruptible, even the ornament of a meek and quiet spirit, which is in the sight of God of great price. Silence is the opportunity for God to speak to the heart of a man. But when we speak of silence and the places of solitude, many think of it as the absence of noise and sound as picked by one’s physical senses. In other words a quiet room, a lonely mountainside etc. These places are good for retreats when we seek solitude. 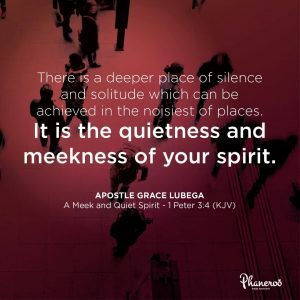 However, there is a deeper place of silence and solitude which can be achieved even in the noisiest of places: It is the quietness and meekness of your spirit. God, in our theme scripture has revealed to us that meekness of spirit is of great price, immense value and immeasurable worth to Him. It is possible, child of God, to sit in a quiet room and yet not have a meek and quiet spirit before God. The Greek word for quiet herein is undisturbed, without anxiety. There are people who wait on God with anxious hearts. They are in places of physical solitude but are preoccupied with the demands of every day life. Their hearts are raging storms of worry which make their moments with God a piecemeal apportioning of time to satisfy their consciences that they have been with God yet in fact they have not. Saints, when you exercise your Spirit to be quiet before Him, you will be amazed by how much you will be opened up to the things He seeks to minister to you. May His precious Holy Spirit lead you in this grace. There is a deeper place of silence and solitude which can be achieved even in the noisiest of places. It is the quietness and meekness of your spirit. PRAYER: Father God, I thank you for this precious wisdom. Thank you for the things that build my spirit and keep me in the consistency of communion. My heart is yielded to you everyday to hear, to see and to feel. Wherever I am God, I carry the consciousness that you are speaking to me because my spirit is quiet before you. In Jesus’ name. Amen.